For other uses, see Blind spot (disambiguation). A blind spot in a vehicle is an area around the vehicle that cannot be directly observed by the driver while at the controls, under existing circumstances. Blind spots exist in a wide range of vehicles: cars, trucks, motorboats, sailboats. and aircraft. Other types of transport have no blind spots at all, such as bicycles, motorcycles and horses. Proper adjustment of mirrors and use of other technical solutions can eliminate or alleviate vehicle blind spots. In transport, driver visibility is the maximum distance at which the driver of a vehicle can see and identify prominent objects around the vehicle. 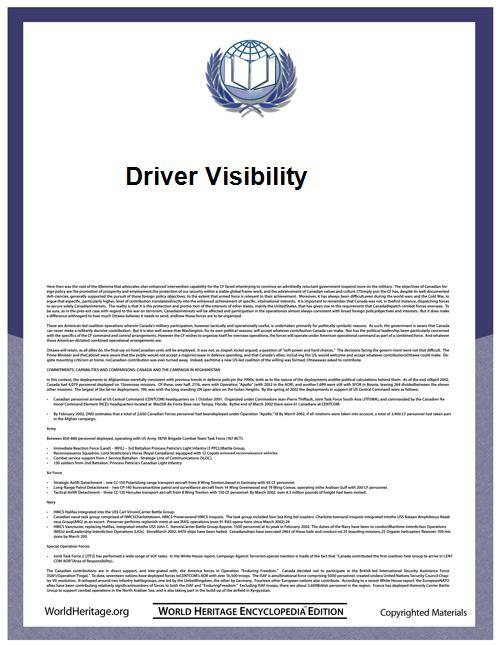 Visibility is primarily determined by weather conditions (see visibility) and by a vehicle's design. The parts of a vehicle that influence visibility include the windshield, the dashboard and the pillars. Good driver visibility is essential to safe road traffic. Blind spots may occur in the front of the driver when the A-pillar (also called the windshield pillar), side-view mirror, and interior rear-view mirror block a driver's view of the road. Behind the driver, there are additional pillars, headrests, passengers, and cargo, that may reduce visibility. If side view mirrors are properly adjusted in a car, there is no blind spot on the sides. Such an arrangement can greatly reduce the probability of side swipes and other accidents, particularly in lane changes. This method was first revealed by George Platzer in a 1995 paper presented to the Society of Automotive Engineers. The method is frequently overlooked in driver's education classes, and takes some getting used to. Calculated elimination of blind spots by properly trained drivers is cheap, and obviates the need for expensive technological solutions to that problem, provided drivers take the time to set up and use their mirrors effectively. The arrangement Template:Mdash pointing the side view mirrors substantially outboard in a fixed mechanical formula Template:Mdash is relatively simple to achieve, but it takes some knowledgeable effort. It is reputed to be a lifesaver. Of course, rearward invisibility is an entirely different matter. The area directly behind vehicles is the source of Back-up collisions, particularly involving pedestrians, children and objects directly aft of a vehicle. That area has been called a "killing zone." These problems are the object of a number of technological solutions, including (in rough order of technological complexity) rear-view mirror, side-view mirror. fresnel lens, sonar, parking sensors and backup camera. A similar problem attaches to positions left and right of a vehicles' rear bumper as the driver attempts to back out of a parking space. Specially designed cross traffic alert warning systems have been developed. eliminated by reducing overlap between side and rear-view mirrors by adjusting side mirrors so the side of the car is barely visible when your head is between the front seats (for the right side mirror) and almost touching the drivers window (for the left side mirror), then checking to be sure you can see cars approaching from behind on either side when on the highway. Other areas that are sometimes called blind spots are those that are too low to see behind, in front, or to the sides of a vehicle, especially those with a high seating point. Most passenger cars have a diagonal pillar as shown in this side view. The angle between the horizon and A-pillar is approximately 40 degrees with a straight pillar that is not too thick. This gives the car a strong, aerodynamic body with an adequately-sized front door. The sides of a panoramic windshield are curved, which makes it possible to design vertical A-pillars that give the driver maximum forward visibility. However, it is impossible to design an aerodynamic small car with a vertical A-pillar because the more vertical the A-pillar is, the less space the door opening has, and the greater frontal area and coefficient of drag the vehicle will have. Some modern car designs have an extremely flat A-pillar angle with the horizon. For example, the Pontiac Firebird and Chevrolet Camaro from 1993-2002 had a windshield angle of 68° with the vertical, which equals just 22° with the horizon. A flatter A-pillar's advantages include reducing the overall drag coefficient and making the car body stronger in a frontal collision, at the expense of reducing driver visibility in a 180° field of view from left to right. A flatter A-pillar (and therefore windscreen) is also a factor when calculating the effects of a collision with a pedestrian. In general a flatter angle will result in a more gentle impact, directing the pedestrian "up and over" rather than directly into the windscreen. This is partically true for cars like the Mercedes-Benz A-Class which also have a low angled engine cover. Other traffic can not see the driver through the reflection if the driver can see them. The heater needs more time to heat the bigger window surface. The flat windshield angle does not let snow slide off easily. The driver cannot reach the whole flat window to clean it easily. Driver height can also affect visibility. An A-pillar that is split up and haves a small triangle window (Front Quarter glass) can give a short driver visibility problems. Some cars the windshield is fillet with the roof-line with a big radius. A fillet round A-pillar can give a tall driver visibility problems. Also sometimes the A-pillar can block the driver from seeing motorcyclists. Also the B-pillar can block the vision of a tall driver in small 4 door cars. A driver may reduce the size of a blind spot or eliminate it completely by turning their head in the direction of the obstruction. This allows the driver to see better around the obstruction and allows the driver better depth perception. However, with the top down there are no B or C pillars, improving driver visibility behind the driver. It is best if the dashboard has a non-reflecting dark colored surface. A small dashboard gives some reflection on the lower part of the windshield. A big dashboard can give reflection on eye height. It is best if the inside of the A-pillar has a non-reflecting dark colored surface. Some new model cars have a very big sunroof. Sometimes the sunlight through the roof lights up the dashboard and gives a reflection in the windshield. Other design factors may prevent a manufacturer from maximizing visibility. These include safety, as narrower pillars cannot be made strong as easily as thicker pillars, and size restraints pertaining to aerodynamics, as taller, more vertical windshields create additional drag and reduce fuel efficiency. They also include fashion and cost, whereby design and appearance considerations can be deemed preeminent. BLIS is an acronym for Blind Spot Information System, a system of protection developed by Volvo. Volvo's previous parent Ford Motor Company has since adapted the system to its Ford, Lincoln, and Mercury brands. This system was first introduced in the Volvo S80 sedan and produced a visible alert when a car entered the blind spot while a driver was switching lanes, using two door mounted lenses to check the blind spot area for an impending collision. On Ford products, the system was first introduced in the spring of 2009 on the 2010 Ford Fusion and Fusion Hybrid, 2010 Mercury Milan and Milan Hybrid and 2010 Lincoln MKZ and Mazda 6. This technology was also introduced on the 2010 Mazda CX-9 Grand Touring model. Some newer and more costly systems use side radar offering better performance and also warn of fast approaching vehicles entering the blind spot. Blind spots also exist in front of boats. When the boat accelerates, the bow rises, increasing the size of the blind spot. Large vessels can have up to several hundreds of meters of blind spot.This is generally known as the dead visual range of a ship. To address this, cameras are sometimes placed in the front of the vessel to cover the missing field of view. Blind spots exist where areas behind the sail are obscured from the view of a helmsman on a sailboat or windsurfer. This is especially true when they are heeled over; consequently, transparent windows are sometimes sewn into the sails.